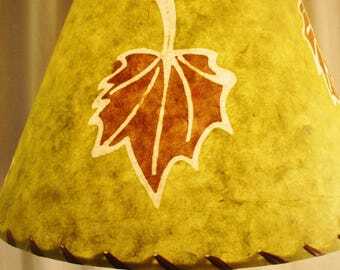 This skeleton leaf lampshade is made in New Hampshire - all hand cut, constructed and stitched from the highest quality materials. The thick, off white, textured paper is from Thailand, and is embedded with real skeletonized leaves. This preservation process involves soaking and scrubbing each leaf to expose the veins, and then pressing and drying them. They are often dyed and then they are embedded in the paper as it is being made. This paper is available in several leaf colors. Please see the last two photos for the leaf colors, and the variations to see what I have left in stock. 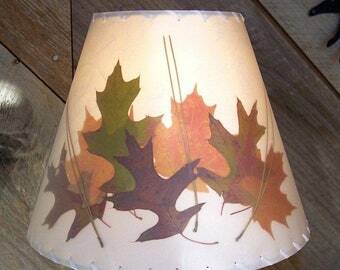 When lit, your lampshade will bathe your room in a soothing natural light and the leaves really stand out like they are blowing in the breeze. 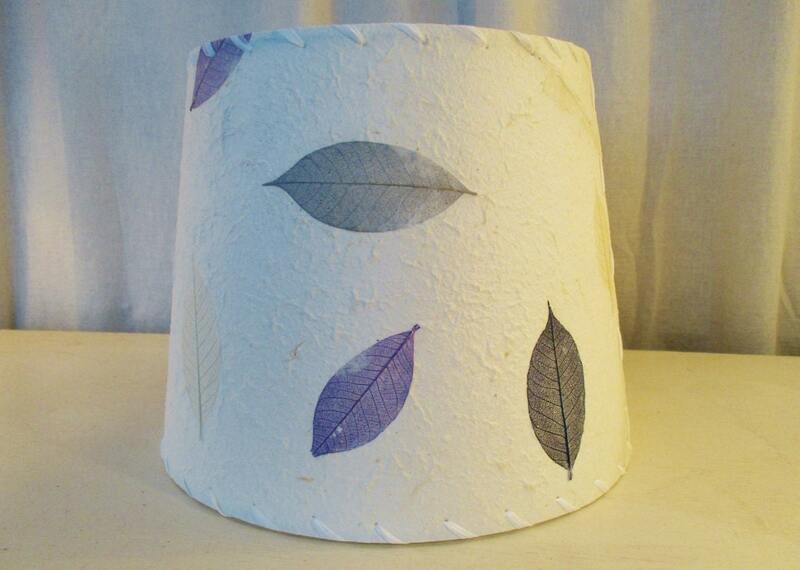 No two shades are alike with this gorgeous handmade paper, which will become a focal point in your home. The shade pictured measures 8" x 10" x 8", and is the purple, silver, blue mix. It has a washer top fitting for your lamp with a harp. Other colors of this paper are available for special order - please see the last photo to see the colors I have and select the size you need. You will also need to let me know what type of hardware you need; clip top, washer top, or bridge top. Lampshades are always measured top diameter x bottom diameter x height. Other sizes are possible, please contact me for special orders. Made in a cat free, smoke free home. Lampshade sales are final so please ask questions and be sure of your purchase. NO RETURNS ON LAMP SHADES.